Notaí CLG Tulach an Iarainn - Tallow, Co. Waterford, Ireland. Wishing a speedy recovery to Mike Kearney from all in the club. CLG Tulach an Iarainn will hold our monthly committee meeting on Thursday June 28th at 8.30pm in the clubhouse. All members are requested to attend. A warm summer’s sun and the prospect of a competitive encounter between local rivals Tallow and Lismore brought a sizeable crowd to a resplendent Pairc De Paor on Friday evening. The light breeze wasn’t exactly hair parting but Tallow had the benefit of it for the opening half. An industrious Kieran Fraser who contested every ball that crossed his path put Tallow ahead with a brace of points to settle his team for the fray. Lismore replied with three on the trot to put them ahead; the only time they would lead throughout the game. Tallow registered 4 consecutive points from Rob O Sullivan, Eoin Condon, Eoin McGrath and again Kieran Fraser who was well up for this local derby. Lismore stayed in touch and always posed a threat. They finished the low scoring half just 2 points in arrears (Tallow 0-9 – Lismore 0-7) and looked like they had more to offer. To be honest I was thinking at half time we had our work cut out to win this game. Kevin Henley, who continues to given outstanding service, covered every blade of grass and contributed 4 points in total. He fired over the first point of the second half. Lismore had a number of goal chances and landed plenty of ball in the Tallow square but were denied by a defiant Tallow defence marshalled by James Murray, Ken, Noel, Jack and Stinger. John Paul Grey hasn’t lost his touch. His booming puck outs and timely saves contributed to the eventual outcome. . I better not forget Stephen Pratt! He reads the game well and rarely wastes possession. Brian McCarthy scored 1-1, maintaining his consistent scoring ratio. When Brian gets in gear he poses a serious threat. Lismore’s performance drooped midway through the second half when they were still in contention. Games turn with a flick of a ball! Had they converted goal chances it might have been a different story. Tallow introduced Ben Aherne and Billy Henley. Both lads injected pace and offered a renewed threat to the Tallow attack force which in turn took the pressure off our defence. Tallow were comfortable winners at end of play. 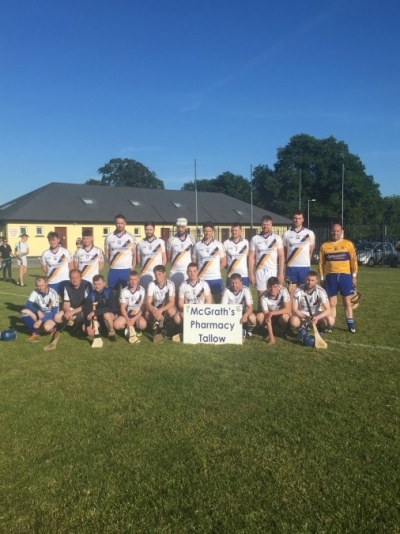 JP Grey, S Pratt, J Tobin, E Hickey, N Condon (0-1), J Murray, Ken Kearney, K Fraser(0-4), K Henley (0-4), T McGrath, E Condon (0-1), R O Sullivan (0-4) , E McGrath (0-1), B McCarthy (1-1), M Murphy, B Aherne (0-1), B Henley, S Curley, S Slattery. Dungarvan top the group unbeaten in 4 games. Tallow hold second place with 3 wins out of 4 which sees them into the semi- final. Dungarvan are the form team and favourites to take the Western title. Other contenders will have to step up to the mark. All to play for!